Our Shi-Zun, last name Zhang, first name Kui-Sheng, also known as Kuang-Bi and Tian-Ran in the Tao Temple, was born on July 9, 1889 in Jining, Shantong Province of China. When he was born, miraculous signs occurred; the Heavenly Altar in Beijing was on fire, which lightened up the sky with red radiances, and the always-muddy Yellow River became clear. These are evidences resembling the birth of the Son of Man. Shi-Zun was born with special physical characteristics, among which are dual pupils in each eye. Humble and honest, he was born with heavenly sagacity as well. 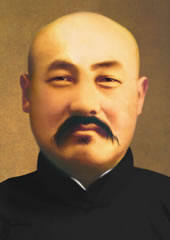 In 1915, Shi-Zun met Mr. Zhu and received Tao. After he comprehended Tao, he developed strong faith and vowed to cultivate and propagate Tao. After Mr. Zhu returned to Heaven in1920, Patriarch Lu valued our Shi-Zun highly and allowed him to serve around Patriarch Lu. It enabled Shi-Zun to learn from Patriarch Lu's infinite merits and nurtured by his boundless virtues until Patriarch Lu returned to Heaven in 1925. In 1930, the Almighty God ordained Shi-Zun and Shi-Mu to inherit the Heavenly Decree; the heritage of Tao thus continued. Since then, Shi-Zun and Shi-Mu had shouldered the holy responsibility to architect the utopia of Maitreya. After countless trials and tribulations, Tao was spread all over China by 1945. In 1946, Shi-Zun was invited to Chengdu, Sichuan Province, China. On August15 of the following year, Shi-Zun returned back to Heaven at the age of 59. The Almighty God then bestowed him as a Buddha named Tian-Ran . Although our Shi-Zun was crowned with this supreme title, his grandiose vow is infinite. Countless sentient beings have been and will be moved by his vow. Everyone will benefit with the fulfillment of his vow to build the utopia of Maitreya.